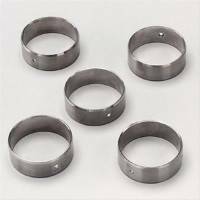 High performance cam bearings are available at PitStopUSA.com in a variety of styles and applications. Cam bearings combine the strength of a copper-lead alloy layer with steel backing and an electroplated babbitt metal. The steel backing provides strength and durability while the babbitt overlay provides the critical surface characteristics of slipperiness and conformability.